The skiing at Jay Peak and Burke was New England cold (but mostly in double digit temperatures) but the snow was grand. The mountain companies have used this cold weather to cover the hills with snow. Three days of skiing at Jay gave us plenty of time to enjoy the glades and other challenges of the mountain. The fourth day at Burke proved to be a relaxing time enjoying about 4" of fresh powder. Two days at Killington, followed by a day on Okemo, where the overnight trip and the day trip met up. We had over 100 skiers on the mountain. The Sunburst Six Bubble chairlift with heated seats at Okemo makes getting up the mountain a joy in any temperature. 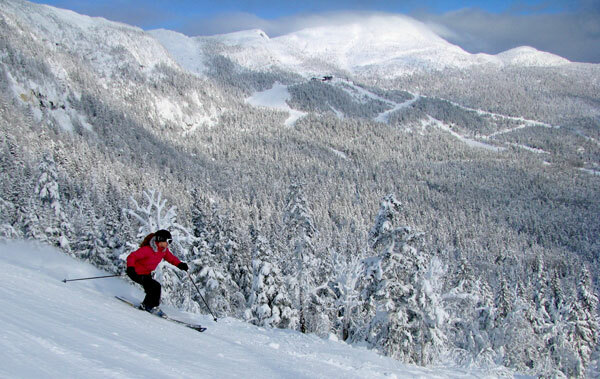 It was New England skiing but each day saw better conditions with the man-made snow accumulation. The days were cold but the nights were hot! We literally lit-up the Outback Nightclub dance floor on Tuesday evening with the glowing accessories provided by trip leader, Nancy Bradford.